Literary nonsense (or nonsense literary) is a category of literature, which balances elements that make sense with some that do not by an excess of meaning, rather than the lack of it. The most well-known form is nonsense verse and is present in many forms of literature. The nonsensical nature of this genre defines its humor, rather than wit or the typical punchline of a joke. Certain formal elements of language and logic facilitate the meanings of the piece and are balanced by elements that negate meaning. These formal elements include semantics, syntax, phonetics, context, representation, and formal diction. For a text to be within the genre of literary nonsense, it must have an abundance of nonsense techniques woven into the fabric of the piece. This is created by the use of faulty cause and effect, portmanteau, neologism, reversals and inversions, imprecision (including gibberish), simultaneity, picture/text incongruity, arbitrariness, infinite repetition, negativity or mirroring, and misappropriation. Nonsense tautology, reduplication, and absurd precision. The genre has been recognized since the nineteenth century derived from two broad artistic sources. Firstly, oral folk tradition, including games, rhymes and songs, such as nursery rhymes. For example, Hey Diddle Diddle and Mother Goose. Secondly, the intellectual absurdities of scholars, court poets and other intellectuals who created sophisticated nonsense forms of religious travesties, political satire and Latin parodies. They are separate from the pure satire and parody by their exaggerated nonsensical effects. Today the genre is a combination of both of these methods. A popular writer, Edward Lear used this genre in his limericks. Other nonsense literature examples are The Owl and the Pussycat, The Dong with a Luminous Nose, The Jumblies, and The Story of the Four Little Children Who Went Around the World. Flann O’Brien’s The Third Policeman, can be considered a nonsense novel. 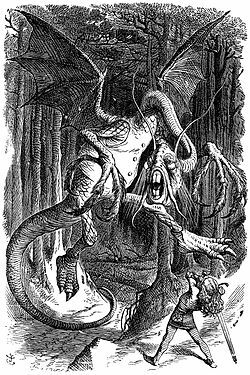 A favorite of mine is Lewis Carroll’s Jabberwocky – it is a quintessential nonsense poem. Do you have a favorite nonsense story or poem?